Lone Star Self Storage Use Tips! You can just have the movers pack your stuff, store it and then just wait for them to deliver it all at your new home. However, this can be a problem if you need access to your things in between your move. Many companies only store things one time and you’ll have to wait until delivery date to get everything. If you need to put your things in storage anyway, you may find that you can save some money by storing with movers. Once you have all of your belongings, though, you may realize that you may not be able to use–or even have the room for–everything and will still need to seek out a storage facility which will add to costs. Moving companies specialize in transporting items, but not necessarily in keeping them safe. You’ll have to make sure that the company you choose has a good track record and that they will take all necessary precautions to protect your things. A moving company may only have insurance for when they are moving and not storing your things. You’ll need to clarify this with company representatives. At Lone Star Self-Storage, you can rest assured that anything you store with us will not only be safe but easily accessible (we have 24-7 access options available). And if you’re worried about getting into long-term contracts, don’t be. 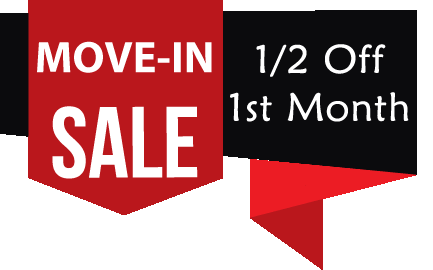 We offer month-to-month leases that are as easy to get into as they are to get out of. So if you’re looking for a truly cost-effective storage method, look no further than us!